Agua Para La Vida is committed to truly sustainable solutions, and they have demonstrated it in the most significant way by actually starting a school for Potable Water Technicians. The initial little tiny project that APLV did back in the 1980's, of course, was mostly done by brigades of volunteers coming down for a few weeks at a time. But when you do that, your project has little hope of being maintainable, because there is inadequate in-country expertise. To counter this, APLV started up the "Escuela Tecnica para Agua Potable", or Technical School for Potable Water back in the 1990's. It's a fully accredited 2+ year class involving every aspect of potable water design and development, including the theory and practice of planning and engineering the delivery systems and including everything else that APLV does with a project. Three classes have now graduated, and the fourth class (of 8 students) is about halfway through. For this class, 70 students from all over Nicaragua applied for the full-ride scholarship (including room, board, and tuition), and just the 8 slots were available. But what an education they get. They come out with all the mathematics and engineering to do technical work on water systems, and have a fully-accredited "Bachelor" degree, similar to an honors technical high school degree. Their presence in various organizations throughout Nicaragua means that projects don't have to spend money on high-priced consultants to do the work that these specialized technicians can do. 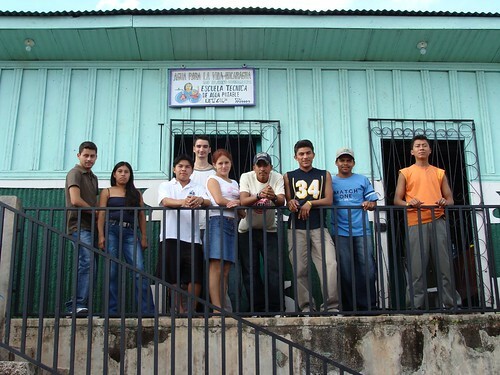 APLV's "ETAP" school is the only school graduating water technicians in Nicaragua. The school has typically been taught by workers who come from abroad to do a year or so of duty. The first group of students was taught by the founder of the organization on various trips to Nicaragua. This past year the curriculum has been taught by a talented French graduate engineer, Gilles Burkhart. Now that the school has matured, Gilles has a full building for the students, including men's and women's dormitory areas and a well-equipped classroom including computers. Gilles is about to move to other duties within the organization, and he'll be replaced for the coming year by another French engineer. At the end of this two-to-three-year cycle, yet another class of qualified, trained potable water technicians will be available to APLV and to rural Nicaragua at large.